I know most people don’t get excited about saving for retirement and I used to be one of them. But I can’t wait to share what I’m about to share with you! No lies. What if you could save for retirement without noticing? And what if it was completely painless? As in, you hardly noticed it was happening and it didn’t change your budget. That could be a game changer, my friend! There have been many years where we had zero extra dollars to save for retirement. Zero. Sometimes we’ve been able to contribute to a 401(k), other times we didn’t have that available to us. We have some retirement savings, but not the amount that the pros say that we should have by now. 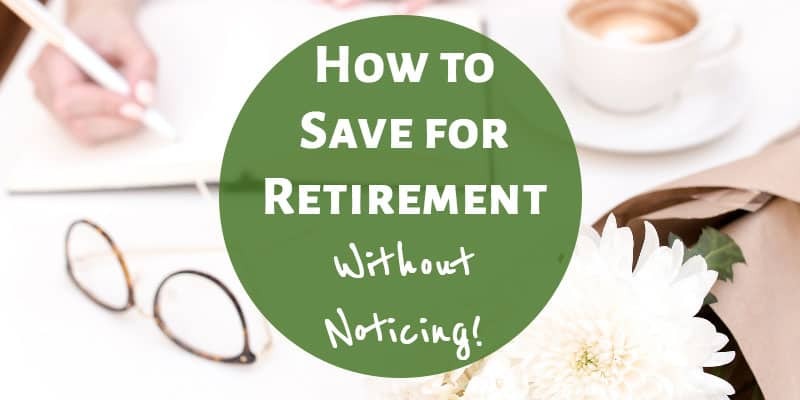 So, while we currently are contributing to my husbands 401(k) and I recently set up automatic deposits to my Roth IRA, I’ve also been on the lookout for how to beef up our retirement savings. And this is why I’m so excited! 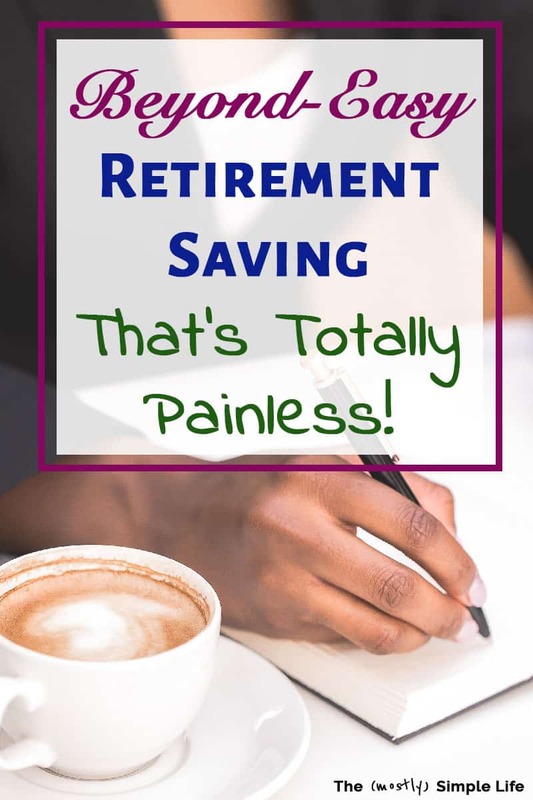 If this service had been around back when we were completely broke, I think we would have been able to save more for retirement pretty painlessly! It’s called Acorns and what they do is round up your purchases and invest the spare change. So say you spent $11.37 at Subway, Acorns rounds that up to $12 and invests $.63 in your IRA. You link your checking account, debit card, or credit card to your Acorns account. Acorns virtually rounds up each purchase you make to the nearest dollar. When your round-ups reach $5, they transfer the money out of your “funding source” account (whichever account you told them to take the money from) into your investment account with them. You select how you want your money invested, which they make super easy for you. They will recommend one of their portfolios for you and then you can change it if you want to. There are five portfolio choices ranging from conservative to aggressive investing. It’s all so easy and automatic and you hardly notice a thing because you’re just rounding up each purchase. Set Up Your Acorns Account Here. In our first month of using Acorns, we saved about $45 for retirement! This was spread out over 82 transactions. I don’t expect that we will save that much every month because we had some reasons to shop a lot more than normal during that month. And I truly didn’t notice it happening! As I spent money throughout the month, I simply rounded up my purchases to the next dollar as I recorded them in my budget. So when I went to record our grocery spending, I wrote down that we spent $63 instead of the actual $62.85. 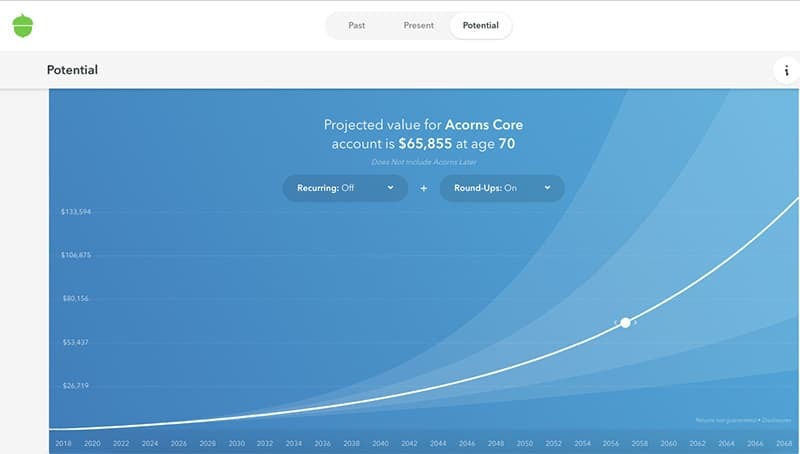 Based on the investment portfolio you choose and your average savings each month, Acorns shows you the projected value of your account by the time you reach retirement age. Right now, my account says it will be worth close to $66,000 by the time I’m 70! Not bad for saving my spare change! Is It Enough to Retire On? Just saving your spare change with Acorns is not going to give you enough to retire on. BUT, I think can be a super smart part of your retirement planning! I’m sure that I’ll be able to come up with something to do with my potential $66k when I’m retried, don’t you? And for being able to save for retirement without noticing, I can’t think of a good reason why not to do it. If you do want to save more than just your round-ups, you can set up other recurring deposits as well. You could add an additional $5 per week or $200 per month. It’s up to you. You can also set up a multiplier on your round-ups. If you set up a 2x multiplier, the $.30 you were going to invest on a round-up gets doubled to $.60. Click here to learn more about Acorns. All retirements investments have fees of some sort, and while I am definitely not a financial pro in any way, I’ll explain the Acorns fee as best I can. The Round-Ups feature is part of the the Acorns Core account, which costs $1 per month. From other financial reviews I’ve read, the $1 per month price is a bit high as you’re starting out since you many only add $10-20 to your account in your first month (though I added $45 in my first month). As you add more to your account through the months, the $1 fee becomes a better and better deal if you look at the percentage of the fee versus how much you have invested. Here’s what I think: $1 per month to be able to automatically and painlessly save my spare change is absolutely worth it to me. I can spend $1 per month on a lot stupider stuff, so it does not bother me at all that as I’m first starting out the percentage of the fee versus my account value is a little rough. It’ll only get better the more I save and I love how easy this savings method is! I know it’s obnoxious to say that it’s for everyone, so I’ll get more specific (even though I think it’s probably a good idea for anyone with ten or more years left until retirement). Anyone who thinks they don’t make enough money to be able to save for retirement. Acorns makes it painless and you can essentially save for retirement without noticing and without it affecting your budget in a big way. I wish this had been around years ago when were so broke that we didn’t invest at all. Anyone who want their retirement savings to be easy and automated. It happens automatically and is simplified in the best possible way. I set up my account in minutes and haven’t had to do anything since. With their five investment portfolios, they make investing less overwhelming and more accessible to everyone. I absolutely love how simple and easy Acorns makes it to save for retirement without noticing. It can be painful to see hundreds of dollars come out of your account each month, and it might not be possible at all if money is tight. But rounding up each purchase and investing the spare change is completely doable. I only wish that Acorns had been around years ago! There were many years when we didn’t save a thing for retirement, but I think we could have handled rounding up our purchases and saving the spare change. Now, even with our other investments, I like knowing that we’re doing a little extra to prepare for our future! Click Here to Get Started with Acorns Round-Ups!